In the Churu city of Rajasthan, India, a family of 10 is desperately worried. Six years ago, Yousuf Ali*, the third of eight siblings, took a loan to leave for Riyadh to work as part of Empower Contracting, a subsidiary of the construction business Saudi Binladen Group. The dream to support his family did not last long. His concerns started mounting as workers went on a strike in February 2016 over non-payment of wages. The last salary Ali received was a year ago. “I have seven months of salary due. Not to mention six months of waiting for it since then,” says Ali. Around 400 miles west of Rajasthan in Rawalpindi, Pakistan, Masood Ahmed* battles anxiety. His family struggle to make ends meet. “Many a time we don’t have items of daily use in the house. Sickness is a part of our life these days,” shares Masood, Ahmed’s brother. Ahmed has a wife and a school-going daughter studying in fourth grade. “I pay her school fee at times. One time, he (Ahmed) arranged for a loan from a brother in Bahrain. They all seem to be in the same position though,” Masood says. “We think about him and it worries us. We get by somehow but we keep thinking about him. Does he have anything to eat? How is he surviving without any money?” he says. 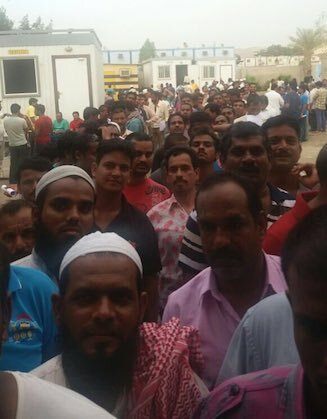 Ahmed and Ali were originally part of a group of 300 workers from India, Pakistan and the Philippines waiting in Riyadh for their salary settlements. Even though the Bin Laden group shut down only in May 2017, salaries have been pending since 2016, and some have even been waiting for their dues to be cleared for 11 months. “Our situation has been worse than animals. Many stories have been done about us and yet the situation does not improve,” says Ahmed. It was only the threat of being held responsible for Ahmed’s death that mobilised the Empower management to get him treated. Ahmed had been writhing in pain due to appendicitis for weeks. His health insurance had expired and he had no means to bear the treatment expenses. Around the same time, Ahmed received bad news from his home in Rawalpindi, Pakistan. His father had passed away. “I felt so helpless. I had no money. My iqama (resident permit) had expired. I could not make a trip and see my father for the last time.” Nor could Ahmad send any money. Until the filing of this story, the management has cleared salaries of all but 34 workers, out of which 31 are from India and the remaining three are Pakistanis. CEO, Empower Contracting, Osama Arafat and the administrative staff of the company declined to comment on the situation despite multiple attempts over the last one month. In March this year, Saudi Arabia introduced an amnesty under which undocumented migrant workers could return to their country of origin without penalty. The campaign, originally set to expire in July was extended to November 15. Ahmed has received his settlement yet still struggles to exit Saudi Arabia. Hired as a ‘camp boss’ to look after fellow workers and aid in day-to-day chores inside the camp, Ali says he had been on call 24 hours a day in the camp. “I was paid for an eight-hour shift and any additional overtime I did.” Ali earned RO2,400 ($640) a month and has not sent any money for the past one year. “I have not been paid for seven months and for any overtime since 2016. Ali’s iqama is valid but he has been waiting for health insurance for over five months. “I can’t process what may happen. If I fall sick, where will I go?” he questions. Azeem Khan*, a resident of Bagh district Kashmir, was among the lucky few who returned before the company went bankrupt. He came back in March this year, when, according to him, trouble for workers was building up. “I have been very disappointed with the overall response of the management there. The agreements you sign with the management are rarely followed by them,” he said. Pakistani workers also complain of lack of support from their embassy. “A few months ago our embassy told us that you will get money from the welfare fund. They took our signatures and called us to tell that they’ll be coming soon to offer some funds. We told them yes we are always in our camp in Haris ul Watni but they never turned up,” complain the workers. “For my case, I recently went to the embassy again that I have been cleared and need an exit permit and they told me they can’t do anything about it. At least other embassies come to camps and talked to their people. Some even served their people iftar in Ramadan. We have been left to die here. No one listens to us,” says Ahmed. Senior Programme Coordinator, International Organisation for Migration, Junaid Khan says that they only reach out in an emergency situation when it is something that the embassy cannot do. “In KSA, workers get into contracts they are not aware of. We have reached out to the government for this. Request for help and evacuation has to come through the country of origin of workers,” he said.